I got a phone call to tell me that it had not been possible to get the road tax renewed. Why? Because the MOT had run out. Given that I had asked (and paid for) the car to be ‘road taxed’ over two weeks ago, I was not happy to get this news when the road tax had run out. So I set myself the task of getting the car through its MOT on the next day – the day where I would be working from home. About 7-8 am I turned up at Google and searched for MOT centres in my part of the world. Halfords Autocentres caught my eye. Why? I know where the local centre is and it is only five minutes drive from my home. And because of the offer. Book Now To Take Advantage Of Our Exclusive Online Deal. Save Today! 2. Can I make an MOT booking for today? Yes, provided there is an open slot at your chosen centre. 3. How long does it take? 45 minutes if no repairs needed, up to 60 minutes if minor repairs needed. 4. What happens if the car fails the MOT? Most repairs can be carried out at the autocentre on the day of the MOT. Within five minutes I had selected my local Halfords autocentre, entered the details of my wife’s car, selected the ‘MOT’ product, accessed the MOT calendar, found an empty slot for that day, booked that slot, entered my contact details, paid, got a confirmation, and printed off my the relevant documents. Easy! Five minutes before my appointed slot, I turned up at the local Halford Autocentre. Alex was on reception, he recognised me, he smiled, he welcomed me. I did not have anything to explain as Alex had a copy of my booking. Exactly on time, one of the mechanics showed up, took the keys and got on with testing my wife’s car; I could see exactly what was happening because the office and service bays are separated by glass. Whilst the mechanic was conducting the test, Alex and I were catching up when he was not taking calls (from customers) or serving customers who popped in. The forty-five minutes flew by. Alex went to talk with the mechanics. Coming back he told me that the car had ‘failed’ its MOT and there was nothing to worry about. Noticing my confusion, Alex explained that the regulations had changed and so the ‘state of wiring’ in-around the engine did not meet regulations. And there was nothing to worry about because the mechanics were tidying up the wiring – the job would be done in the next five to ten minutes. True to his promise, within 10 minutes Alex had my MOT certificate ready. He went through it including pointing out that two tyres would need to be replaced soon. At the end of this review I was expecting to be charged for the ‘tidying up’ of the wiring. Surprise! No charge. What Made This Such a Great Experience? 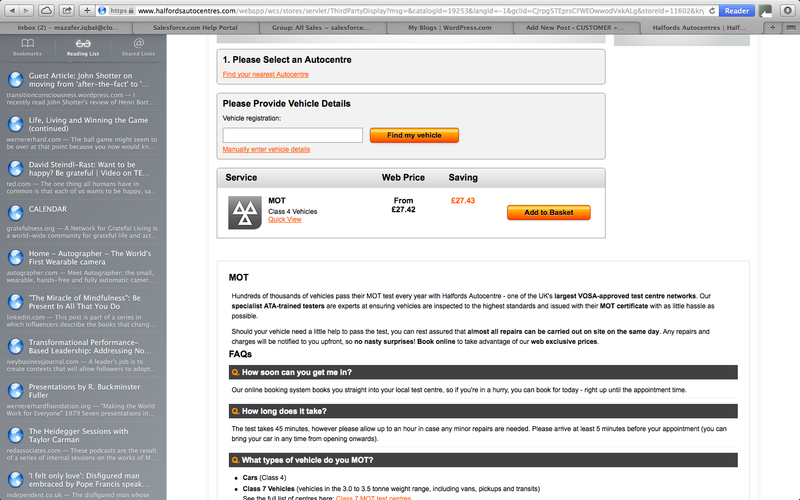 Easy to find local Halfords autocentre, easy to search for MOT slots by day, one click booking of an empty time slot, easy payment-checkout process, online confirmation of booking, ease of printing out the paperwork. The right hand knows what the left hand is doing – in this case the local Halfords autocentre knew of my booking, had printed off the paperwork, and were expecting me. Keeping the promise – the MOT was completed within 45 minutes. And the minor repairs ‘tidying up the wiring’ in-around the engine was completed in the 5 – 10 minutes, and in any case less than the 60 minutes quoted on the website at the time of booking. A friendly face that I knew, who knew me, and who welcomed me. Generosity – the chaps at Halfords could have charged me for ‘tidying up’ the wiring. And I would have paid. They didn’t. Most importantly, they made no big deal of it. In a world where I expect to pay for everything, this generosity of spirit was and is welcome. whilst there is truth in the saying that customers don’t want relationships with companies, this truth turns out to be falsehood when it comes to the human to human level: between the customer and the employees (flesh and blood human beings) who deal with, serve, and help the customer. great experience designers craft experiences where hi-touch integrates with and complement hi-tech; hi-tech is great for making it easy to get jobs done; hi-touch is essential for calling forth the kind of emotions that cultivate emotional bonds. Halfords Autocentres have got it right when it comes to the MOT experience – at least in my case, for this specific experience. Nice story of when all the bits are well joined up and just work like they are designed to. However, essential to this are the employees that make the experience stand out. Interesting story Maz. I have to admit I always thought Halfords was an awful place. I think it might be worth giving it another go. Previous Previous post: What Are The Two Antidotes to Sucking At CRM and Customer Experience? Next Next post: 2013: Where Are We At With CRM, Customer Experience and Customer-Centricity?